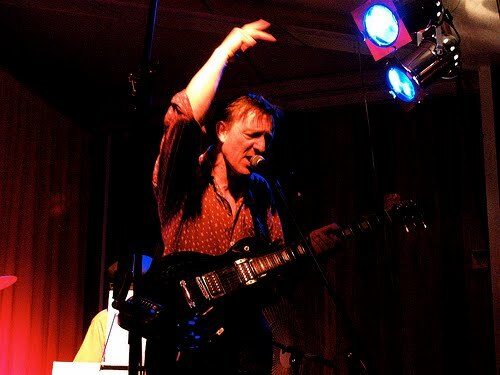 For the past decade or so, Kiwi music legend and writing machine Bill Direen has divided his time between Paris and Dunedin. In Dunedin, Bill has taught English at Otago University, played in various incarnations of his pet band The Builders, and listened to Philip Glass beside the fireplace; in Paris he has focused on his writing, which has embraced genres as differently demanding as the novel, the short story, the theatre review, and the academic paper, but also found time to keep a baleful eye on the right-wing, xenophobic administration of Nicolas Sarkozy. In the middle of 2010 Bill will move once again from the ailing heart of France to the nation he once dubbed the 'South Indies'; this time, though, a prestigious literary award means that he will be taking up residence not in cosy old Dunedin but in the strange city of Auckland. I recently chatted with Bill about the state of French culture and politics, about his upcoming move to Auckland and the award that made it possible, and about his latest literary and musical projects. SH: Could you tell us a little bit about the residency you have won? BD: The residency is at the Michael King Writers’ Centre, Devonport, the only full Writers’ Centre in NZ and one of 90 or so around the world. It is funded by Creative NZ and run in connection with the University of Auckland. I will not be restricted to either creative writing or to research -- I make use of both in my essays and novels, songs and poems. The residency gives me a place to reside, too, so this time in Auckland I won’t be asking if I can kip down on your sofa, Maps and Skyler. BD: Yes, early childhood in the Manahatu and Wellington, but I was born in Christchurch and returned to South Island/Waipounamu for secondary schooling. How do I see the city? Through a small window so far. The residency will help make that window higher and wider, and might help me to understand how people in Auckland have learned to live together. One of the great things about research is that you never know what are going to find. SH: What do you hope to work on in Auckland? You are known as both a musician and a writer: will you be favouring one activity at the expense of the other while you're here? BD: Yes. I will be concentrating on writing while in Auckland. And reading. The writing might include lyrics and poetry, and, as you know, research can be musical or poetic too. I’ll be working on a trans-generic novel and keeping notebooks as usual. I’ve never had the chance to explore Auckland library, so I’m looking forward to that. In October there’ll be an album release of texts written and recorded in Berlin in 2008, to musical accompaniment by musicians from four countries. The texts were published in brief 36. SH: Will it be hard leaving Paris, the city you have made your second home? BD: As you noted above, I have moved about quite a bit and have lived in a lot of houses and in the main towns and cities of South Island/Waipounamu and lower North Island/Aotearoa. Then I overcame a fear of flying and discovered the rest of the world! Leaving is never easy. I will be dealing with the subject of movement across the earth, migration, arriving and leaving in one of the writing projects this year. BD: It is very difficult for immigrants in France. The economy relies upon them, and yet every year laws make it tougher for those working in France illegally. Every year there are the sad stories of stowaways who die trying to get into France, after having paid their life savings to some criminal for a trip to death. The French police were recently charged (by human rights groups) with picking people out of the crowd on the basis of their skin colour, to ask them for their papers (passport, right of residency, or work permit). They defended themselves, and are probably more discreet about it now. It’s never simple. Each country has its contradictions. For example, in France, since the revolution, it has been illegal to practice any form of discrimination based on racial origins. You will never be asked for your racial origins and if you announce them you are regarded as a some kind of racist! So organisations representing minorities (who might benefit from positive discrimination in New Zealand) would find it impossible to get funding in France. New Zealanders are often astonished at the lack of government funding for French people on the basis of their various racial origins (and in spite of immigration-phobia, there is a magnificent complex mixture of origins in France, believe me). Some funding is now available for radio stations in the three ancient languages. On the other hand, France has practiced positive discrimination in the trade sector, subsidizing losses, funding initiatives and practising a quota system. There have been arguments for and against this on all sides. So when it comes to liberal 'reforms', there are greedy players and those who argue the reforms will be better for "French people" (the French Socialist Party liberals, for example) and better for ‘France’ (usually the rightists). But there are anti-liberal currents, and they are getting stronger among the true left and extreme left groups. Divided, the left fell and smashed into bickering pieces. It is in the process of reorganising itself against a formidable opponent. The formation of a united Centre-Left and True-Left wing movement may bring about a change of government next election. It's starting to sound as if I’m talking about the positions of a World Cup soccer team, but French politics IS incredibly complicated. Everyone has a position, and it is usual for people to state it clearly. There’s no sitting on the fence, and there are a lot of arguments. SH: What is the position of New Zealand culture, or cultures, in France? Is there any awareness of our writers, our artists, our musicians? BD: If New Zealand literature has been translated into French, it is read. The French are great readers, as New Zealanders are. This is something the two countries have in common, as Pierre Furlan (a French writer who resided in Wellington for a time) mentioned at a recent talk about New Zealand. But as for English or Maori, French people find it hard to learn English and they have really no knowledge of the ‘Maori’ tongues of French Polynesia (which are not so different from New Zealand Maori). To be fair, English and French are so similar that it can drive a person crazy learning both. There are so many ‘false friends’, words which are spelt the same but which have completely different meanings in French and English. (And if you are learning French, there are the types of French to consider: argot, jargon, everyday, popular and refined -- as there are in English!) The attitude of Germans to English is parental, and I think they find it more logical, an easier process, to learn English. Even if this is an illusion, it helps them overcome the barrier to learning English. So the translation into appropriate French and the 2006 visit of twelve New Zealand writers (of different micro-cultural origins) helped to put New Zealand on the map, with free readings (by paid actors in French, and in English by the writers themselves) all over France. New Zealand was the country of honour at the annual Literary Salon in Paris. A lot of books were signed. But after the publicity splash and the double readings and the fanfares announcing a warming of relations between the countries, I heard little about New Zealand literature in France. Janet Frame is widely read in translation, and Mansfield is well-known. Patricia Grace, Vincent O’Sullivan, Karl Stead and some younger contemporary writers are making an impression, little by little. It will be interesting to see how they fare. France has an extraordinary literary culture, and we know little of that. We both have a lot to learn about the other. This is partly why I founded a little cross-cultural magazine in 2006, called Percutio, which publishes work in English and in the language of origin on the facing page (in French, and in five other languages so far). It is an attempt to be a little less at the mercy of translators. My congratulations to Mr Direen. May Auckland be a good city for him. The French state practices discrimination in the name of tolerance. The current demonisation of Muslims with bans on headscarves has a precedent in the bans on Breton culture. The Bretons were expected to become good French-speaking Republicans. If they were not they were considered reactionaries, even fascists. Does Bill Direen have a position on Breton nationalism? I hope that Bill will work hard in Auckland. Yes Direen, we don't want to hear your music or read your writing; we want to know your position on Breton Nationalism (which isn't reactionary or fascist because it is cultural). The French are revolting. This is not a subjective judgment but a statement of fact. Last Saturday afternoon, a crowd gathered in the main square of the Breton town of Bourbriac, beside the imposing 11th-century church, and set fire to a pile of local estate agents' brochures. "Brittany not for sale!" was their uncompromising message. Britons buying homes in the area were one of the targets for the demonstration - or, as the French more poetically prefer, "manifestation". It followed recent instances of "Brits out" graffiti being daubed on estate agents and the office of the local notary. The sleepy town of Bourbriac (pop: 2,300) has become the focus of Breton nationalism; it has even been dubbed the "village of hate" by the touchier sections of the British press. Not quite Fallujah perhaps, but close. I decide against a flak jacket. I am going to Bourbriac in the spirit of friendship, amity, the entente cordiale. Admittedly, I know only a few words the locals will understand - croissant, pain au chocolat, croque monsieur, Agincourt, Nelson, Sebastian Coe - but I am taking some symbolic gifts purchased at the Waterloo Eurostar terminal and contained in a large plastic bag emblazoned with a union flag. I will be an ambassador for Britain; a one-man peace initiative. From Paris, it is a three-hour train journey to Guingamp, close to the northern coast of Brittany, then a 10km taxi ride to Bourbriac. Snow is falling when I arrive and the village of hate is quiet. My union flag bag attracts little attention from passers-by, but in Le Ty Breizh, a busy bar in the square, there is an audible intake of breath as I enter. At least it would be audible if a Santana CD wasn't playing so loudly. "Many of the houses bought by the British are falling down," says Lucien. "They are ruins. No one lives in them, so what is the problem if the British buy them? In a way, it is a good thing." "The small villages around Bourbriac are being born again," adds Joseph. Eugene's take on the issue I can't quite work out: It may be his age, his high-pitched voice, or the red wine, but he seems to express both sides of the subject at once. It may not be hate, but nor is it quite affection. "The problem started with the graffiti," says the mayor." We don't know who did it, but its effect was to attract the press to Bourbriac. Media coverage then attracted Breton nationalist groups. There have been demonstrations against rising property prices in several parts of Brittany in the past month, but they chose to have the final one here because the media now knows Bourbriac. There are only 35 British properties in the town, and five properties owned by other EU nationals. The number of incomers has been greatly exaggerated. C'est fou !" Gilles doesn't need to translate the last bit. The mayor, who is a socialist, dismisses the "village of hate" tag. "In Brittany we don't have any trouble with xenophobia. It's not like in the south of France, for example. This is not Marseille. The far right polls very badly in Brittany. We have a tradition of openness and tolerance. This talk of the village of hate is nonsense." A little tearfully, I give him a flag of St George to go with the huge Breton flag behind his desk. A moment of touching symbolism.